Welcome friends. There is a new fashion in the market, i.e start SIP. Many peoples are searching about SIP in the internet and most of them are ending up with investment in SIP. But whatever the mutual fund distributors are claiming about their mutual funds and about starting SIP are not fully correct. 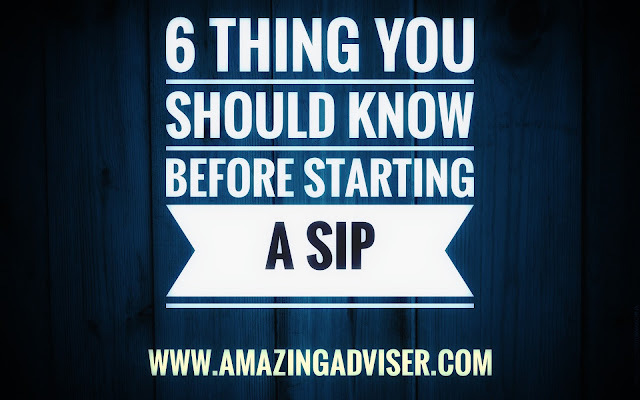 Here I'm going to discuss 5 points which you must ask your mutual fund adviser or distributor before starting a SIP. 1. Fund Expense Ratio - Expense ratio is the expense which you bear on behalf of your investment. In simple language it is the fees or commission which is given to your mutual fund adviser or distributor. Many investors don't even know that they are paying money to their adviser from their own pocket. So you must ask your adviser to state expense ratio and compare the ratio with other funds in the same category. 2. Average Return - Well, I think everyone is concern about it but still asking is different and analyzing is different. I want to say that compare there average return with other funds. You also check the portfolio of your fund so that you can know in future what is that sector, on which your fund is betting on. 3. Composition of Fund - Composition of fund means the ratio of your fund allocation to different asset catagory. It can be equity, debt, money market,gold, commodities, real estate. You must understand how much portion of your fund is allocated to these categories. This is important because the will define your risk profile and risk taking capacity. 4. Close ended or Open Ended - Open ended fund means you can withdraw your money a day after the day of investment. On other hand close ended fund means you have to remain invested for a specific period, i.e lock in period. It can be one year, three year or five years. This is important to know because everyone time frame of investment is different. 5. Tax Benefits - There are certain funds which are eligible for tax exemptions. They are called ELSS or equity linked saving scheme. You can claim exemption under section 80C of Income Tax Act of ₹150000 in India. If you are investing for ax exemption then make sure your fund is in ELSS Catagory. 6. Market is the King -This point is a common thing which I write in my article. This is because truly nothing is bigger, wiser or better than the market. Before investing you must ask about the market. For simplicity market means Nifty or Sensex. To make it more simple consider Nifty as a fruit. Check its value in any business news channel. You can also check from internet. It's my rule that I never invest when Nifty is high. You can follow this or ignore this. This is important and I will give an example to make you understand. In 2008 January Nifty's value was ₹6250 and today Nifty's value is ₹11720 i.e 87% absolute return in 10 years. If some persons would have invested in December 2008 when nifty's value is ₹3000 then today his absolute return will be 290%. You can see the difference of investing in market in different times. So this is a general advise. Again you can follow it or ignore it.